I was lazy this weekend. 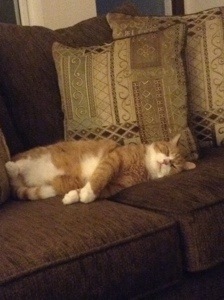 Really lazy. I didn’t want to go out, I didn’t get much accomplished at home and I certainly didn’t want to go to the grocery store. Well. I wanted to, but I didn’t want to *go* grocery shopping. So I went for the last meal from my box and the Indian delivery on Sunday. Yes, I intended to cook, but it just didn’t. But Monday came and I knew I needed to shop and cook. In addition to the holes punctured on the interstate, causing Northern Virginia type traffic, I have been craving chili for a while. The original intention was to make two versions, one regular and one vegetarian, but after a long day at work, I went basic and one chili. 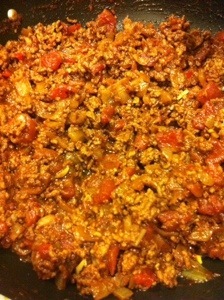 All weekend Bob and I have debated what should go in chili; does it have beans, peppers, onions? How much spice should it have and should it be over rice or plain. 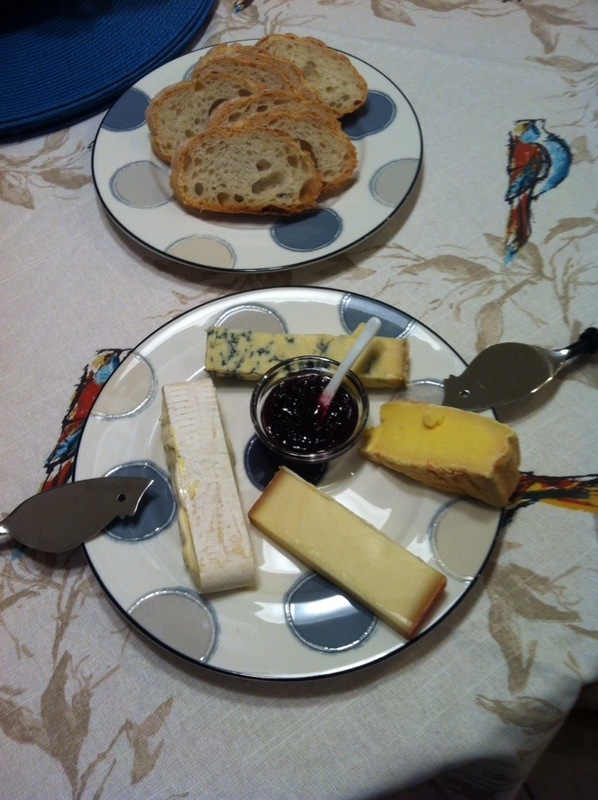 Is cheese a central component? … Can I just say, that for someone who doesn’t know how to turn the stove on, he has strong opinions about chili. The glorious part of actually cooking is that, ultimately, I decide what goes in. 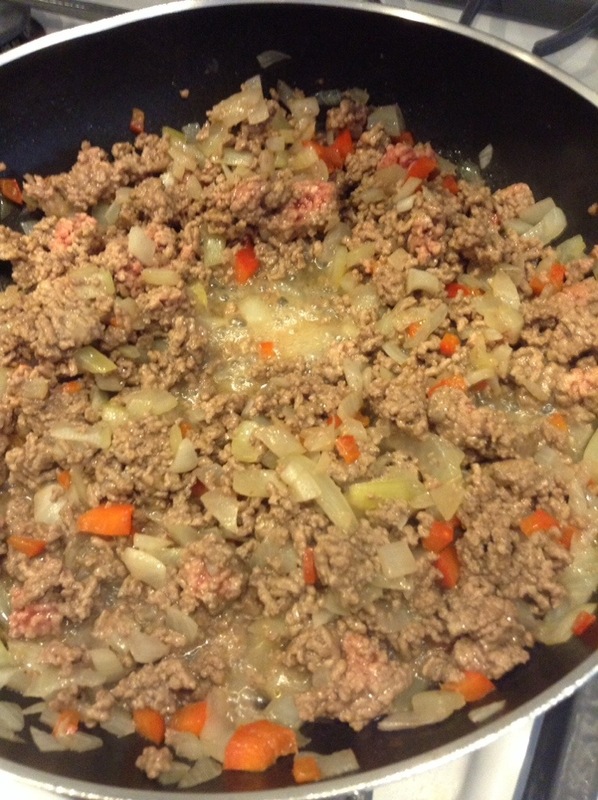 Since I went with a beef version, I decided onion and a little red bell pepper would also work. 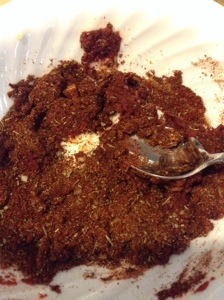 I found a lot of different options for spices for chili, but I went with chili powder (duh), cumin, Italian seasoning, paprika, cayenne pepper and garlic. I also added about two ounces of double concentrated tomato paste. The results were really, really good. Bob couldn’t taste any bell pepper in this (I could) so he was happy and I didn’t have the beans. I’m trying with beans, but it is still a texture issue for me. I made a soup last week with cannelloni beans and kale. Very good with lots of flavor; I ate the beans, but every time I chewed I remembered why I don’t eat them regularly. If I was a kid these days Mom and Dad would probably be told I had a sensory integration disorder; I just think I’m fussy about food whether taste or texture. I got the basic recipe for the chili here. I tried to follow the recipe, but used way less pepper (about a quarter of one medium red bell pepper), less tomato paste and no salt or extra pepper. Also forgot anything resembling a garnish, but I did put it over the coconut rice we had a few nights before. Oddly, that worked really, really well with the chili. I desperately wanted cake today. I’ve been very good since the Christmas baking has gone and I just wanted cake. 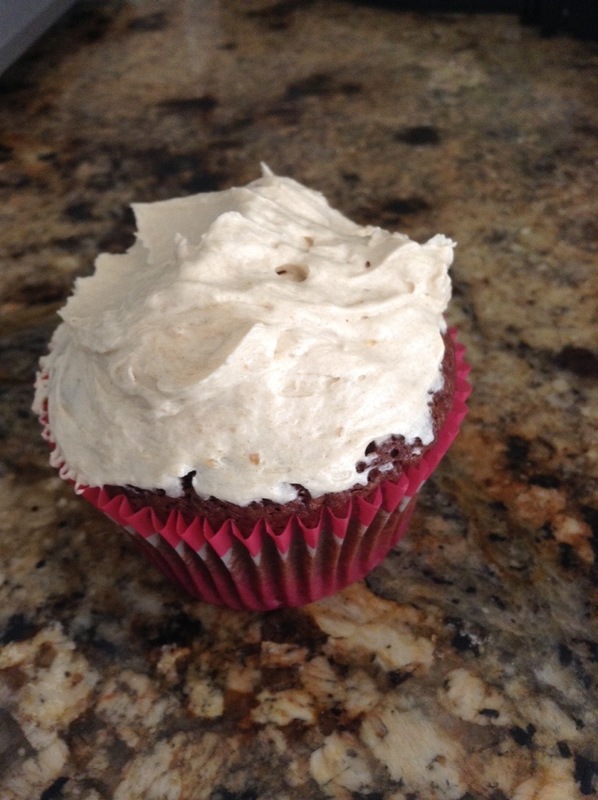 Vanilla is my favorite, but I decided to go for chocolate today and made cupcakes because they are cute, individually portioned and take less time to actually cook. After I made said cupcakes, I realized I had not replenished my confectioner’s sugar supply from the chiffon cake experiment. Icing makes the cake – cake is, after all. Only a delivery mechanism for icing and to not have icing is, well, almost a disaster. Not one to give up I scoured the internet for alternatives. Yes, I could have driven the two miles to the store and picked up confectioners sugar, but this was a do-as-little-as-possible day so I didn’t want to do that. I found several recipes that mentioned using flour in milk, heated to boiling to thicken with granulated sugar and butter. Well, I decided to give it a try figuring the worst that happens is that is turns out like most of my icing experiments, but this actually worked. I used a half cup of coffee instead of milk and three tablespoons flour then let it cool (ok, put it in the freezer since I’m impatient when it comes to cake and icing). I used a stick of butter and a half cup of sugar, mixed well them added half the flour/coffee mixture. I was so shocked that this worked but it really did. 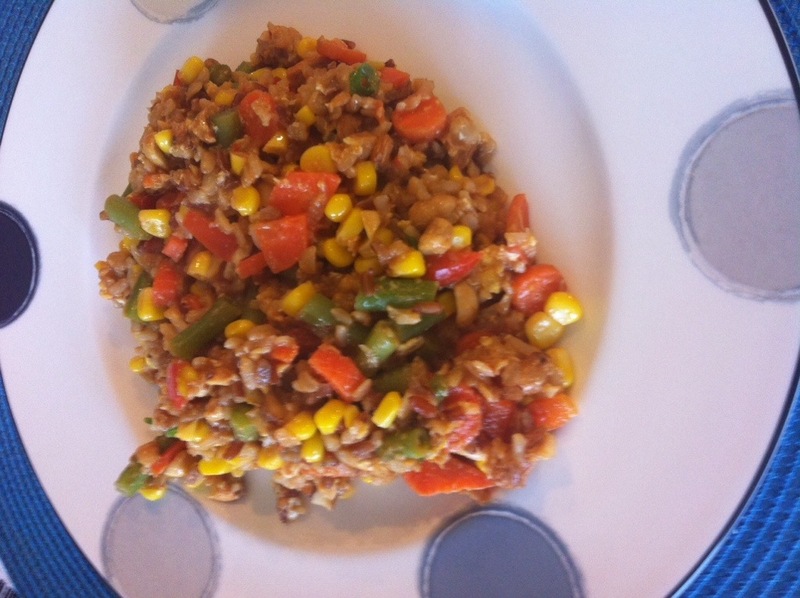 I also made a fried rice this week – used my Pad Thai sauce recipe – and made a nice vegetarian fried rice for dinner. Bon thought it was good. I really loved it. We are keeping warm these days – We turned the heat on and put the flannel sheets on the bed. The cats have been super cuddly with the cool weather and Tigger slept on my back one night. Almost 16 pounds of dead weight is not conducive to a good night’s sleep, but he is so cute, you just can’t stay mad at him. This little experiment may help me convert to a southerner. I will always be a Jersey girl at heart, but I’ve got so many southern relatives now that I feel I should try a little southern every now and again. 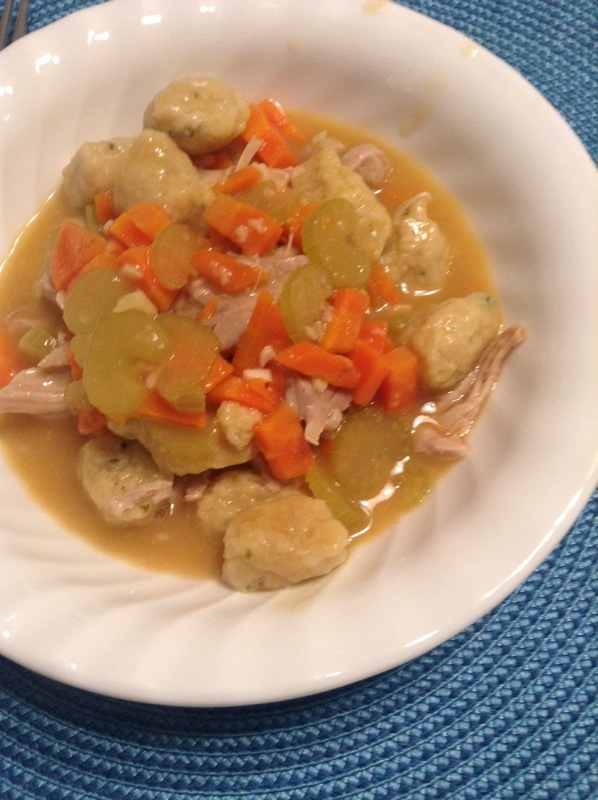 Mom let me borrow a recipe or two that she cut out of Southern Living and this Chicken and Dumplings came from there. Since I can never follow a recipe exactly, my version is below. Combine everything up to the flour together and mix until smooth. Add the flour just until incorporated. Fill quart size storage bag and cut one corner of the bag to make a piping bag. Pipe by 1/2 to 1 inch ribbons (I use kitchen scissors to cut) into boiling water. This was done in batches to give the dumplings room. Cook until they gloat to the surface then remove with a slotted spoon. Melt butter in the skillet used to cook the chicken. Add celery and carrots. Cook a few minutes until slightly softened. Add garlic send cook about one minute. Add wine and stir until pan is deglazed and wine is reduced to almost half. Sprinkle flour over vegetables send stir. Put in herbs and stock/broth and stir to combine. Let boil then cover and reduce heat and cover. Cook over medium low heat for 20 minutes. 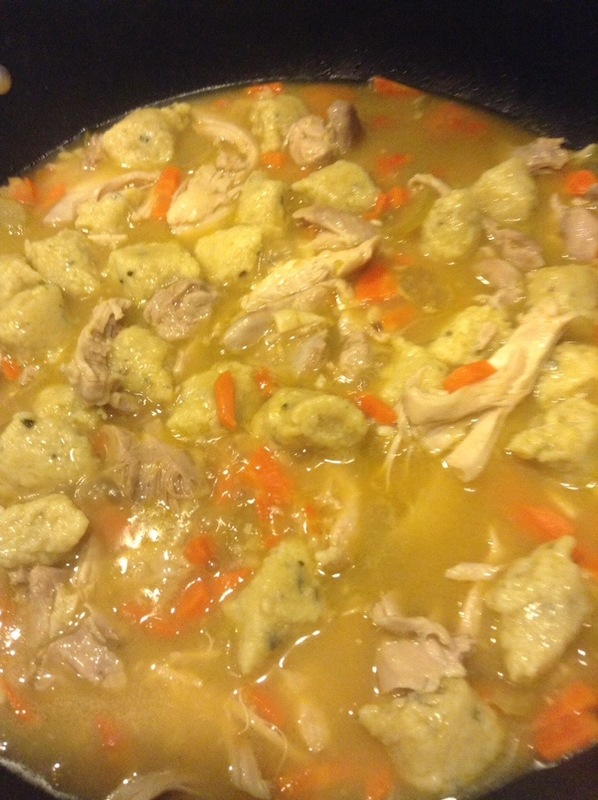 Remove herbs and add chicken and dumplings. Mix well and cook over medium heat for about 5 minutes. If you have some fresh herbs, sprinkle over the top before serving. Otherwise, divide into two bowls and enjoy. As for wine, I always go with one that I would drink. I usually use a Kitchen Sink white table wine (it is surprisingly good for a ten dollar white table wine) but today I used a white Bordeaux. have to say, I really like this one. 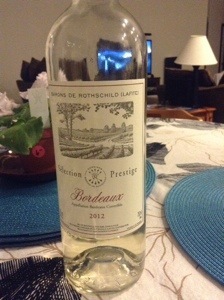 A little grapefruit flavor, but a nice round wine. Just enough acid and tang with no oak or bitter notes. 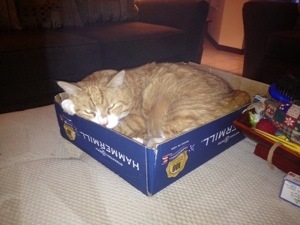 Cats are the teenagers of the animal world. They are moody, needy, insistent little things that eat way more than their size suggests and they stay out way too late and become so very cute and cuddly when they want something. 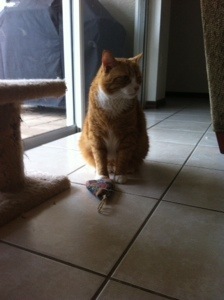 Tigger is a particularly interesting case. 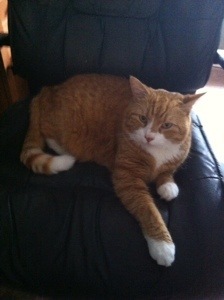 He is a rather large (yes, probably fat) cat, especially when compared to the other two. 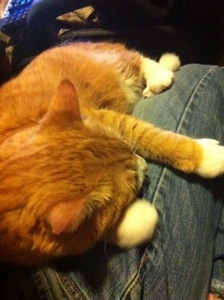 He is super friendly and cuddly with me – a regular lap cat. When Bob and I sit on the couch he curls up with us and you can do pretty much anything to him. Mess with his ears, hold his paws, move his tail … he just rolls over and requests a belly rub. and just generally looking adorable. But have company over? 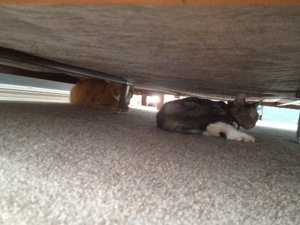 Have anyone including Mom and Dad in the house, and he hides under the bed. 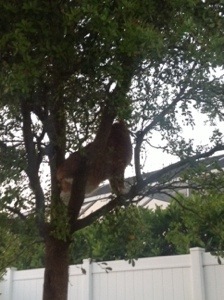 Look at Tigger when walking by him (or just walk by him) and he runs like his life depends on it. I’m pretty sure Val and Bill have not seen him in person as he is just the scared-y cat of the bunch. 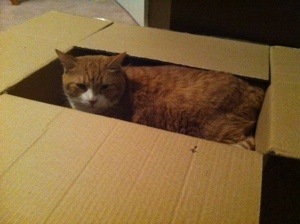 I suppose that isn’t a bad thing in the grand scheme of things; after all he is a cat. One of the best things about having a great, local cheese shop is getting to know the owners and having the owners know you. We have that and I have to say, I think I benefit the most from this relationship. We picked up our January Cheese Club box this week and since there was a blue cheese, Louise included a Point Reyes Toma just for me. She knows I don’t do blue cheese so she included a little something extra. She even wrote on the tag my name. I told Bob he got all the blue, I get the Toma. It was rich, creamy, smooth and so tangy and good, I loved it. Ribiola, a smooth buttery sheep and cow cheese from Italy. He this one rivaled the Von Trap cheese from December and as Val said, the Von Traps know cheese. Challerhocker. I had never heard of this little cheese from Switzerland, but it will change the way you think about Swiss cheese. It has none of the waxy texture or flavor I generally associate with Swiss cheese. It did have the holes though – just a few. Colts on Bassett Stilton. As much as I loved the Toma, Bob loved the Stilton even more. 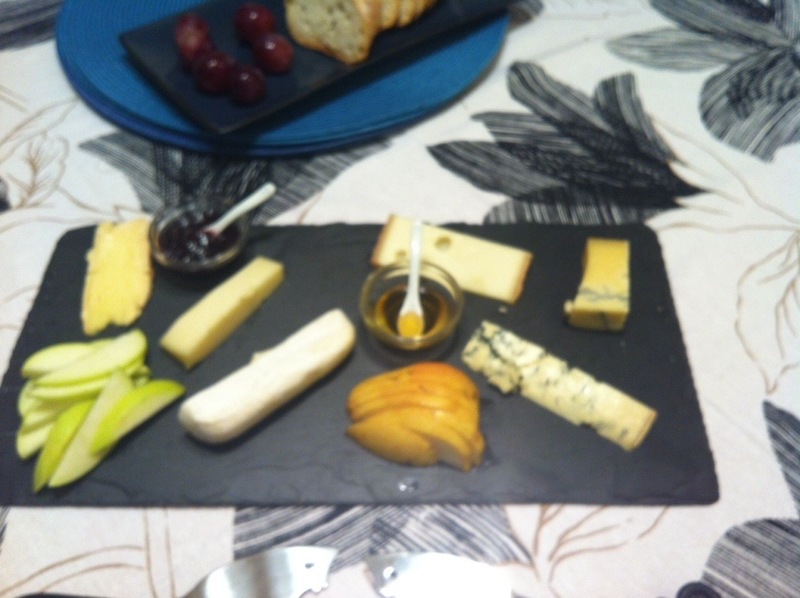 He raved, gushed and swooned over this cheese. He almost had me wanting to try it, but … well … I don’t do blue cheese. But he swears this was the best blue cheese he has ever had. I have done some cooking this week. 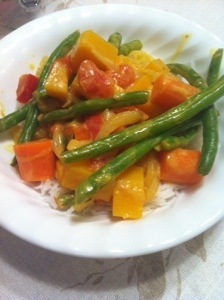 I made a nice vegetable curry. 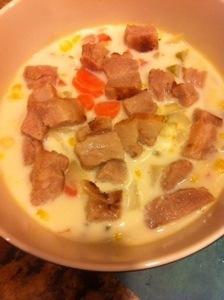 I also did a corn chowder. I do think this one came out a little thin, but I followed the recipe almost exactly. 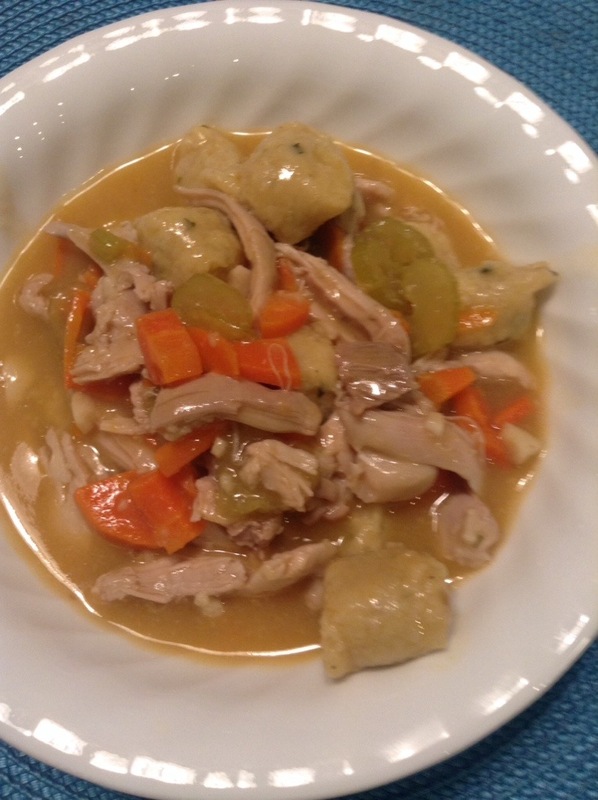 We loved the flavor and it wasn’t hard to make, but I still think it needed a thickening agent. Maybe start with a roux instead of plain butter. I added some pork I had in the fridge for Bob. After a lot of traveling last year, I haven’t been up for lots of travel. 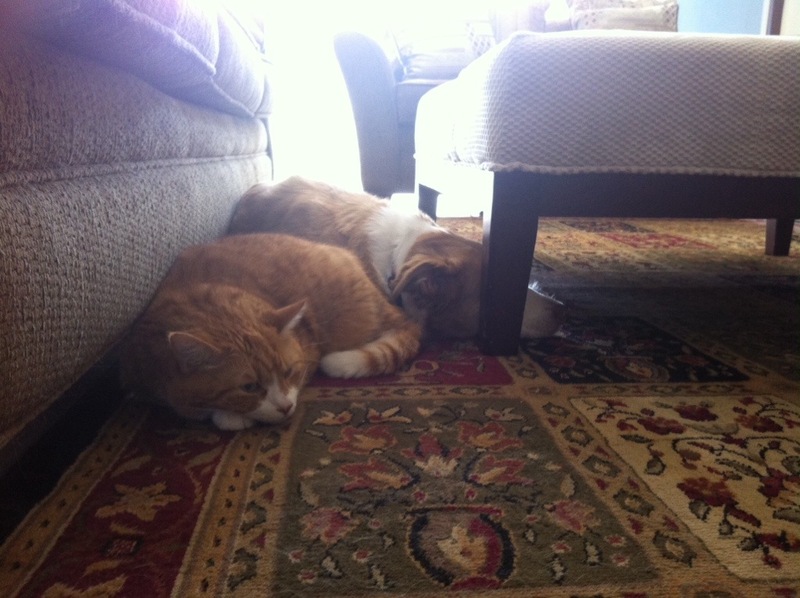 I’ve been enjoying being a homebody and hanging out with the pets. But recently I’ve been getting the itchy feet again, but still want to sleep in my own bed (and not take time off work which I’m sure my boss appreciates). To this end we have started looking at things to do around here. Last weekend I suggested ice skating, but Bob vetoed that idea. In all fairness, it is probably the first time he has totally nixed something I wanted to do, so I’ll give him that one. 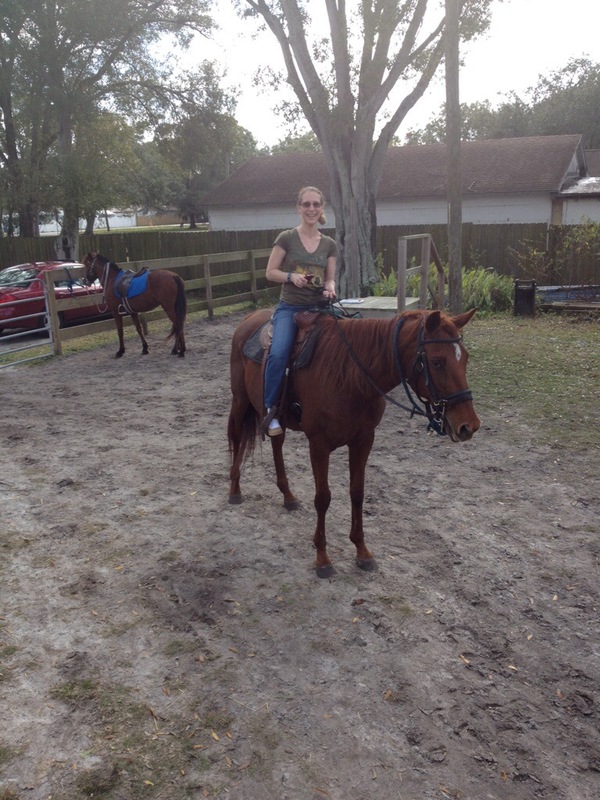 But after thinking about what might be a fun day out, we decided to try horseback riding. I looked around for someplace to take out novices and found a few possibilities. When I started reading reviews Cypress Breeze Farms came up over and over as well run, friendly staff and having very healthy and cared for horses. Yes, there were cheaper places out there, but I have a thing about animals – they should be treated well and care for since they depend on humans. We have a responsibility to them. I called and made an appointment for us and was very, very happy when one of the first questions was how much riding experience we had. None pretty much covers it. We had such a good time. 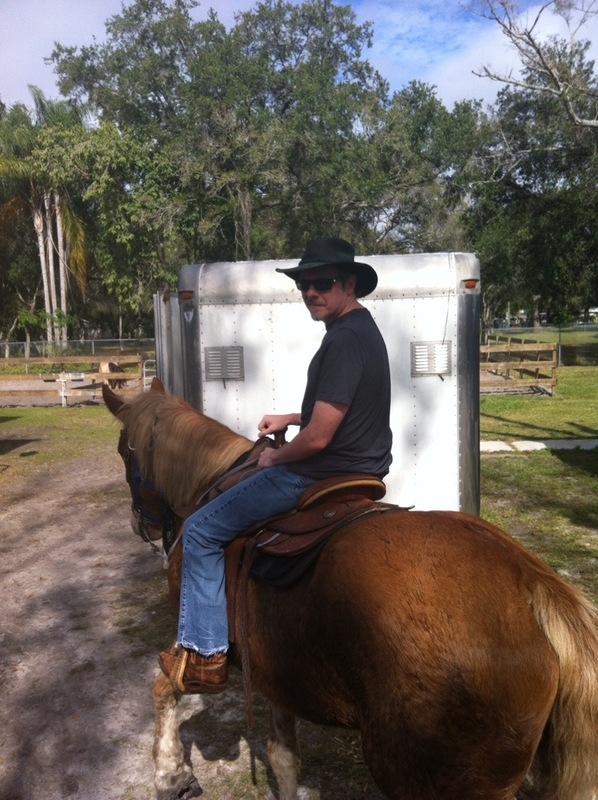 I would never think Pinellas Park would have horse trails and farm country, but there are a lot of horses there. Nestled in among the neighborhoods are trails and equestrian centers that make for a very pretty ride. The horses were very sweet and easy to ride, the guide was awesome and we had a really great day out. Pretty sure both of us will be sore tomorrow, but it was a great afternoon. We made a full day of it and had lunch in St. Petersburg then hit the farmers market there. And the best part is I’m home tonight to watch the Patriots Colts game and sleep in my own bed with my own furry creatures around. I don’t do seafood. Haven’t in years. Something about throwing up for hours that made eating it less than appealing. But after the visit to the allergist last year where I found out it is fish only (and really only really really allergic to anchovies) I started trying shellfish again. A piece of shrimp in Key West, a taste of Bob’s lobster at Marina Jack’s and the shrimp and rice ball at Mozaic on New Year’s. So far so good and this week, I decided to try cooking shrimp. This was not an impulse cook. Bob and I really like the Hello Fresh boxes we started getting after I had to stop the veggie baskets because of work hour conflicts. I get to experiment with food and ingredients, but I don’t have to figure the experiment out a few nights a week. One of the options for this week’s delivery was a Cashew Chili Shrimp over brown rice. I figured it looked ok and I liked the idea of shrimp better than mushrooms and Alfredo sauce. Bob really liked the idea of shrimp so we went for it. After a seven meeting day today, I came home and tried my hand at shrimp. I fully admit I was apprehensive about this little experiment. Would my stomach handle the shrimp? 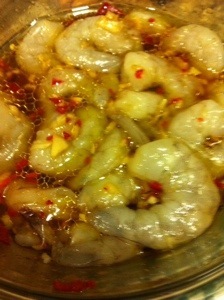 Would I be able to cook it ok (shrimp is temperamental and super easy to over cook)? Would I even like shrimp after all these years? Who knew, but worst case I have leftover pizza or need to take off work tomorrow. Well, I started the rice, chopped the garlic, ginger and chili pepper and made the marinade with the cute little soy sauce packets they sent (along with the aromatics) and some olive oil. 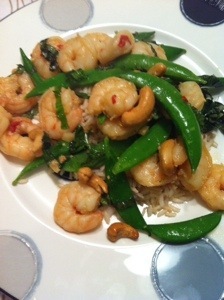 I cooked the shrimp for a few minutes then added the snow peas and then the basil and cashews. I tossed everything and came up with a pretty little plate. The results: I went a little heavy on the chili pepper, which means Bob loved it. He thought the shrimp were cooked well (yea me) and had a good flavor. I liked them, but I liked the snow peas more. He also thought the shrimp were a really good quality for something you would buy (instead of fish up yourself I suppose) and was impressed with the overall plate. There was plenty for us – almost enough for a third serving, but Bob had seconds. All in all, a good little meal and I have to give Bob credit for the a Hello Fresh find. And just because I’m throwing around names of things, the podcast Bob found this from is The Morning Stream so if you are looking for an amusing morning radio type program, there is my one recommendation for the year.